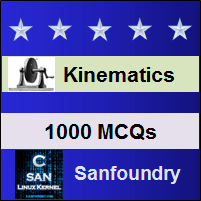 This set of Machine Kinematics Multiple Choice Questions & Answers (MCQs) focuses on “Contact Ratio”. Explanation: It is due to easy manufacturing. = 1 + 100/25 =5. 4. Speed reduction in a gear box is achieved using a worm and worm wheel. The worm wheel has 30 teeth and a pitch diameter of 210 mm. If the pressure angle of the worm is 20o, what is the axial pitch of the worm? Axial pitch = circular pitch of the worm wheel = πm. 6. A pair of gears forms a rolling pair. Explanation: In rolling pair one link rolls over another fixed link. Explanation: The pitch surfaces of such gears are hyperboloids of revolution. 8. Gears with involute tooth profile transmit constant velocity ratios between shafts connected by them. Explanation: For involute gears, the common normal at the point of contact between pairs of teeth always passes through the pictch point. 9. In the case of spur gears, the mating teeth execute pure rolling motion with respect to each other from the commencement of engagement to its termination. Explanation: The involute profiles of the mating teeth are conjugate profiles which obey the law of gearing. 10. A pair of helical gears has fewer teeth in contact as compared to an equivalent pair of spur gears. Explanation: In spur gears, the contact between meshing teeth occurs along the entire face width of the tooth, resulting in a sudden application of the load which, in turn, results in impact conditions and generates noise.